Choosing an extension cord for household devices is often looked at a “one size fits all approach.” It can be as simple as rummaging through the cords in your garage until finding one that matches and is long enough or purchasing the cheapest one at your local hardware store. However, there are some important factors that should also be considered when determining which extension cord to use. Two of the most common household plug configurations are two prong (NEMA 1-15) or three prong (NEMA 5-15). The three prong (NEMA 5-15) plug has a round pin for the ground wire, which helps prevent the risk of electric shock. The two prong (NEMA 1-15) is not grounded. Many devices, however, still incorporate the two prong (NEMA 1-15) style, such as electric fans, lamps, TVs, and charger cords, while higher powered devices such as refrigerators and microwaves typically use the three prong plug (NEMA 5-15). Household extension cords come in multiple wire gauges for different applications. A thicker gauge cable is typically used with more heavy duty items. This is mostly known as the orange extension cord everyone has at least one of in their garage and/or basement somewhere. Depending on the length of this cord, it has a max output of about 10 to 13 amps. It is useful for powering handheld power tools, electric trimmers, and other small household devices. Due to the thin wire gauge, there will be a noticeable drop in power at lengths exceeding 50ft. These power cords can supply the maximum 15 amps from a household outlet up to 50ft., but are de-rated to 13 amps at lengths between 50 to 100ft. These cords are usually recommended for powering dehumidifiers, power equipment, and other devices that tend to draw higher amounts of power. Because of their versatility up to 50ft., they are usually recommended for many household devices. 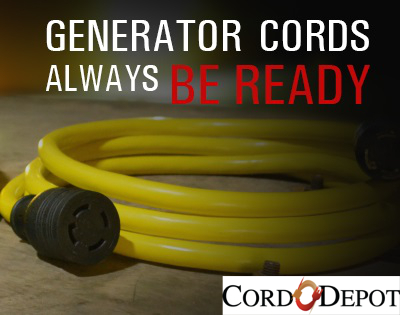 The 12 gauge extension cords are typically used for contractors and in other related settings. These durable cords are designed for power tools and other large devices. The thicker wire gauge enables them to be used up to 100ft. without any noticeable drop in power. These cords are ideal in situations where accessibility to outlets is minimal as they can extend to long lengths. Power cords with 10 gauge wire are typically not used for any standard household items, but are excellent for powering a RV, boat, fridge, electric vehicle, etc. from a standard household outlet. The thick 10 gauge wire ensures maximum power will reach the device from lengths up to 100ft. away. Having a thicker gauge cable than what is recommended is better than using an extension cord that has thinner gauge wire. When using a thinner gauge wire, the device plugged in may not power on at all. This could lead to a misdiagnosis that the extension cord is faulty, but it could also be that the device simply did not have enough power to run. Even if a device is able to initially run off a lower gauge extension cord, it could still lead to problems such as the device burning out or not working properly. It is designed for use in damp/wet conditions, stays flexible up to -50°F, and is also oil resistant. For additional information on understanding the various cable jackets, please read our other blog post: The Difference Between Other Power Cords’ Jackets. *For more specific recommendations on the right extension cord for your device, please also review the owners’ manual.